A $7.3 million dam-rehabilitation project on Tibble Fork Reservoir triggered an unexpectedly large release of sediment into the North Fork of the American Fork River on Saturday, August 20, 2016, after crews began draining the 10-acre lake. While federal and local officials anticipated some sediment transport downstream as the reservoir was being drained, the volume outpaced predictions as well as best management practices (BMPs) required under the project’s U.S. Army Corps of Engineer (USACE) National 404 permit (29 KB) to protect water quality. Located in American Fork Canyon, Tibble Fork Reservoir is fed by the American Fork River, Deer Creek, and Tibble Fork Creek. The reservoir is a popular fishing, hiking, canoeing, and boating area and provides irrigation water for local irrigation companies. NRCS performed an assessment of Tibble Fork Dam in 2004 which concluded that reservoir’s 50-year-old earthen dam does not meet current NRCS and Utah State Dam Safety regulations and engineering standards for a high hazard dam. The dam rehabilitation project is designed to stabilize the structure to meet safety standards, prevent flooding, retain sediment, increase the storage capacity of the reservoir, and extend the life of the dam. Prior to the sediment release, the American Fork River below Tibble Fork Dam met water-quality criteria for designated beneficial uses for infrequent primary contact recreation such as fishing, protection of warm-water and cold-water game fish, and agriculture. Above the reservoir, there was insufficient data to determine if the river’s water quality supports its beneficial uses. 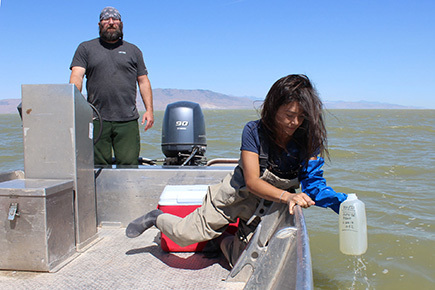 Elevated metals concentrations from historic mining activities have been found in the reservoir’s sediment, but have not typically been found in the water itself. Upstream mines include the Live Yankee, Globe, as well as a number of other abandoned gold and silver mines. Estimates of existing sediment volume in the reservoir is approximately 151 acre-feet. According to the NRCS, dam construction required the total drainage of the reservoir to begin work on the dam embankment. The agency expected elevated sediment levels, but BMPs were to be in place to minimize sediment transport, and all discharges were to be in accordance with the Environmental Assessment (EA), applicable permits, and state and federal laws. Officials anticipated that any increased sediment in the downstream waters would be temporary and dissipate within 48 hours of release. The Clean Water Act (CWA) requires a 401 permit to ensure that the dam rehabilitation project does not violate state water-quality standards; both numeric and narrative. Certification for this project was obtained as part of the USACE Section 404 National Permit (244 KB). The CWA also requires a Utah Pollutant Discharge Elimination System (UPDES) Storm Water General Permit for Construction Activities and the development of a Storm Water Pollution Prevention Plan (SWPPP). American Fork Canyon was once a hub of gold, silver, and lead mining activity. Concerns about adverse effects to the canyon headwaters from mine drainage have led to mine-reclamation initiatives to improve water quality. However, the reservoir sediments still contain heavy metals from these earlier mining activities.